Jakarta Vice Governor, Sandiaga Uno said, Sunter Intermediate Treatment Facility (ITF) construction, North Jakarta, is targeted to start by the end of this year.
" Its progress is very positive and we hope this construction can be started before end of this year"
He explained, Sunter ITF construction will be realized through cooperation between PT. Jakarta Propertindo (Jakpro) and Fortum Corporation, a company from Finland with business-to-business concept. 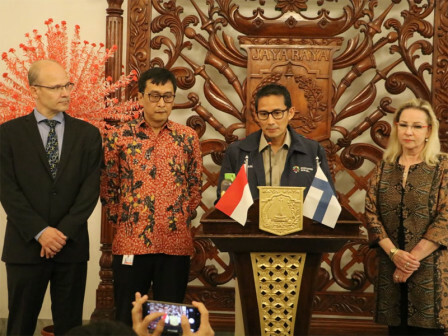 "Its progress is very positive and we hope this construction can be started before end of this year," he conveyed after meeting with Finland Ambassador, Paivi Hiltunen Toivio and Fortum's delegation at City Hall, Tuesday (8/7). Meanwhile, PT. Jakpro Business Development Director, Hendra Lesmana considered, his side needs Jakarta Government's support to realize Sunter ITF construction. "As we have conveyed to vice governor, currently we are still chasing our target to hold groundbreaking by the end of this year," he stated. For information, Sunter ITF is projected to have a capacity to destroy 2,000-2,200 tons waste per day or around 30 percent from total waste in Jakarta. It will be done by burning waste at 1,200-1,600 Celsius degree thus later it can produce 35 Megawatt electricity.